Zirconium tritelluride (ZrTe3) is a semimetal exhibiting charge density wave (CDW) at around 60-70K and superconducting phenomena (Tc~2-5K). It belongs to the group-IV transition metal trichalcogenides. 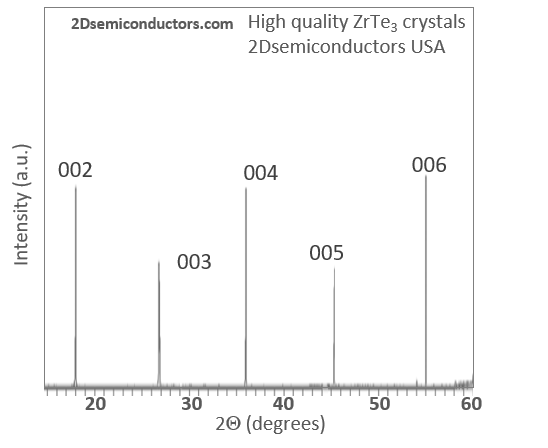 Our crystals have been engineered to attain rather low record defect density (1E9-1E10cm-2) to yield environmentally stable ZrTe3 crystals. Please see Raman spectrum in this document; CVT grown crystals age in air rather quickly whereas flux grown crystals exhibit their true Raman signatures. In fact, Te defects are well-known cause for environmental degradation effects as well as reduced material quality and performace. 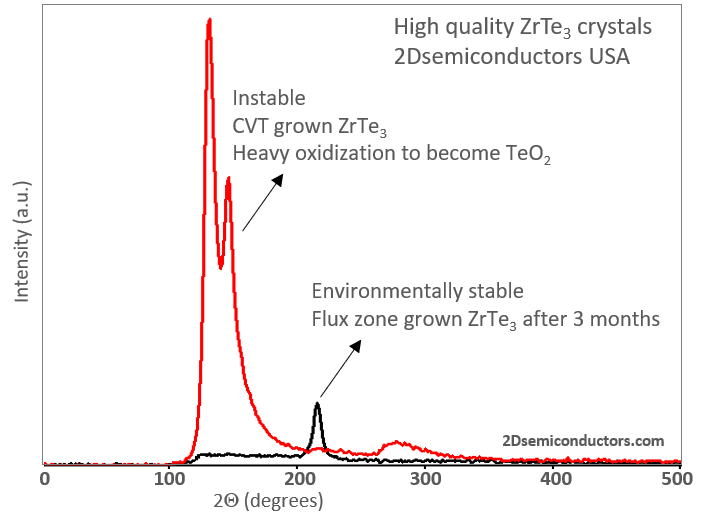 Environmentally stable anisotropic transition metal trichalcogenide material ZrTe3 is available at 2Dsemiconductors USA. ZrTe3 crystals exhibit semimetallic behavior with charge density waves (CDW) phenomena at temperatures below ~70K. Material undergoes superconducting transition at ~2.7K in bulk but it is anticipated to have larger Tc for mono- and few-layers depending on the substrate monolayer interaction. The layers are stacked together via van der Waals interactions and can be exfoliated into thin 2D layers. Our crystals come with guaranteed CDW behavior and stability.